John Baker, owner of John Baker Sales Inc., offers training to paint companies and their distributors in Garmat’s R&D and training center. Englewood, Colo.—In a bid to create a training environment inviting to paint suppliers, collision repair shop owners, and painters, John Baker Sales Inc. has partnered with Garmat, a paint booth manufacturer, to provide training in Garmat’s existing R&D and training center. John Baker, owner and operator of John Baker Sales Inc., a Garmat distributor and service provider since 2010, outgrew his office in Denver’s Tech Center, and sought out a new space that would allow him to combine training, office, and warehouse in a single location. Last summer, Baker said, he partnered with Garmat officials to allow the use of their R&D and training center, located in Englewood, a stone’s throw away from their manufacturing facility. John Baker Jr. demonstrates Garmat’s Hose Hanger in Garmat’s training facility in Englewood. Baker works for his father. 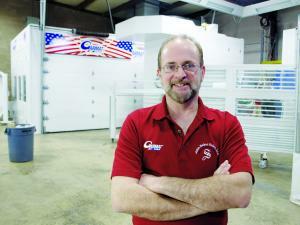 “The paint companies and distributors help us build our business,” Baker said. “We are opening Garmat’s training center for their use. 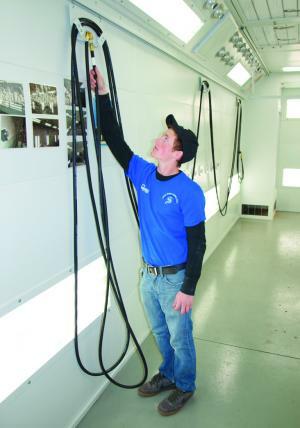 They can train their people and bring in customers to show them new products.” The hands-on feature of the facility is located in Garmat’s R&D showroom, which features two paint booths — a traditional downdraft Garmat 3000 and a modified Chinook II pitless downdraft with a garage door entrance. Garmat has long used the showroom and demo space to show off their products, Baker said, adding that he saw this as an advantage when leasing a portion of the space. Given the multitude of paint booth setup variations, having access to the options in one space is convenient. For example, the center contains a “light board” that displays eight different light fixtures in one space for side-by-side comparisons.